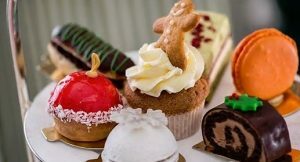 Discover the best Christmas afternoon teas in London this year. Afternoon tea in London is a real treat at any time of year but none more so at Christmas when the city becomes a magical winter wonderland, illuminated with twinkling Christmas lights, beautifully decorated shop windows and wafts of orange and cinnamon oozing out from delicatessens, gift shops and festive markets. 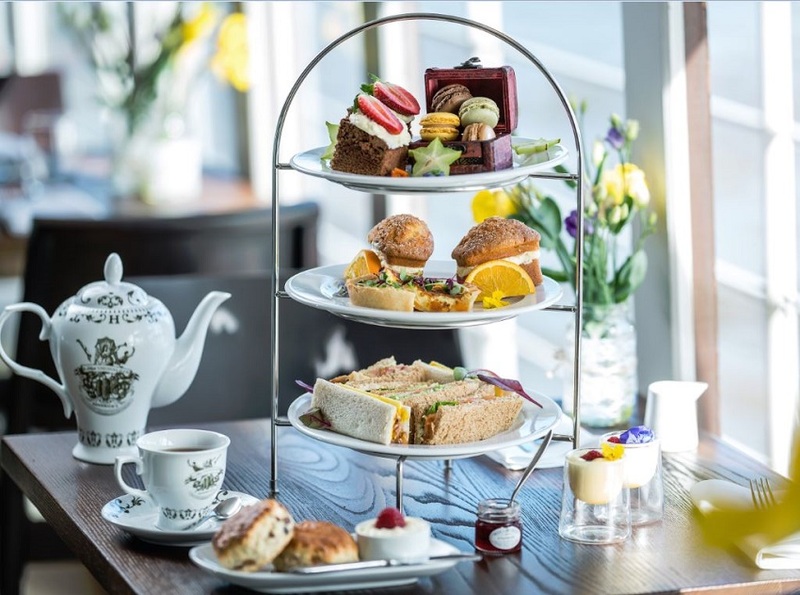 Afternoon tea provides the perfect excuse to take time out and savour the moment whilst relaxing with friends in sumptuous surrounds and indulging in a little “me” time. 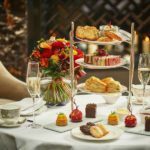 Here is our run down of what we think will be the best Christmas afternoon teas in London 2018. Be sure to book early. All aboard for a fantastic Christmas afternoon tea on this red, vintage, double decker, London bus. One of the best afternoon teas throughout the year, this fun afternoon tea experience, takes on a festive twist at Christmas. 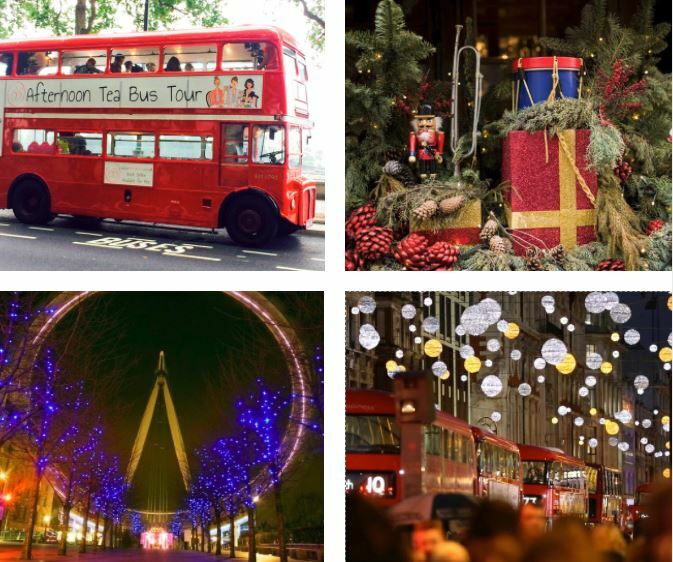 In addition to a special Christmas afternoon tea menu, this London bus provides the opportunity to enjoy London at its most magical time of year. Capture the best city sights and landmarks in all their glory decorated with festive lights. Mid November 2018 until the Christmas lights are turned off. 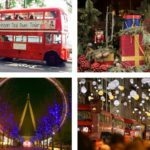 Organise a fun afternoon discovering the best of London this Christmas on the London Bus Tour Afternoon Tea. (Early booking an absolute must) Exclusive 25% Discount. Christmas Afternoon Tea at Fortnum and Mason, London. One of the country’s most revered culinary institutions, who doesn’t love a mooch around Fortnum and Mason in London. 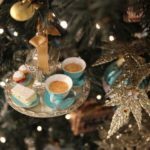 Fortnum and Mason do Christmas so well and we could think of no better way to spend a Christmassy afternoon with a delicious browse around their edible Christmas delights followed by a festive Christmas afternoon tea. 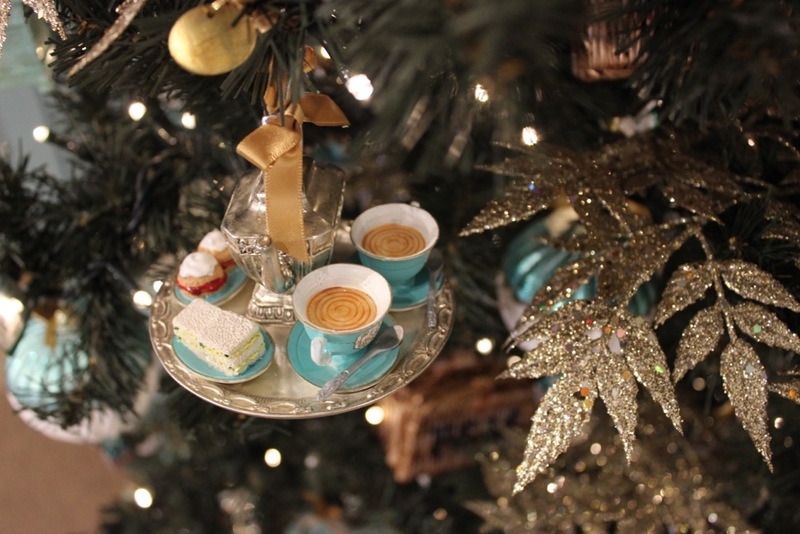 Pictured here is one of their Christmas baubles – this is not your actual afternoon tea – but we thought it was rather sweet. (You can view the real thing on their website here). Christmas Afternoon Tea at the Chesterfield Hotel, London. 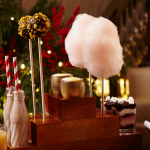 A Winter Wonderland festive flavour awaits you at The Chesterfield Mayfair Hotel. Sparkling lights, Christmas baubles and festive delights and an afternoon tea inspired by the magic of Christmas. 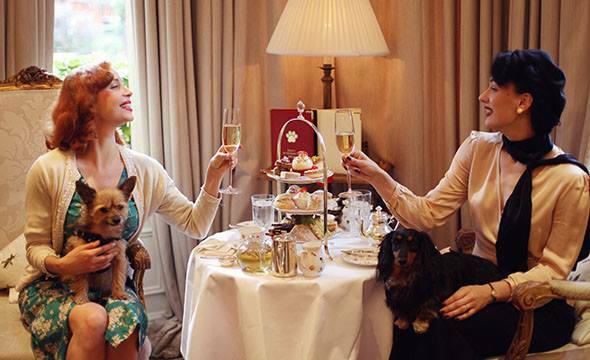 Experience the magic of Christmas afternoon tea at The Chesterfield Mayfair Hotel . . .
An exquisite venue for Christmas afternoon tea in one of London’s upmarket hotels. 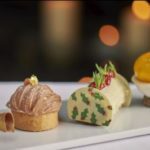 Afternoon tea gets into the Christmas spirit as the Conthis Hotel London’s talented pastry chefs create a dining experience which highlights the best of the season’s favourite flavours. Sit back and relax in luxurious surrounds and escape the hustle and bustle of the city’s busy streets with friends or family. Discover the spirit of Christmas at The Corinthia Hotel London. Christmas Afternoon Tea at Mr. Fogg’s Gin Parlour, Covent Garden. Enjoy a festive G&Tea at Mr. Fogg’s Gin Parlour in the heart of London’s bustling Covent Garden. This vibrant location is matched only by Mr. Fogg’s dazzling afternoon tea. Take yourself on a festive gin safari with afternoon tea or enjoy Christmas cocktails with a deliciously decadent, seasonal cream tea. Book a Festive G&Tea at Mr. Fogg’s Gin Parlour. 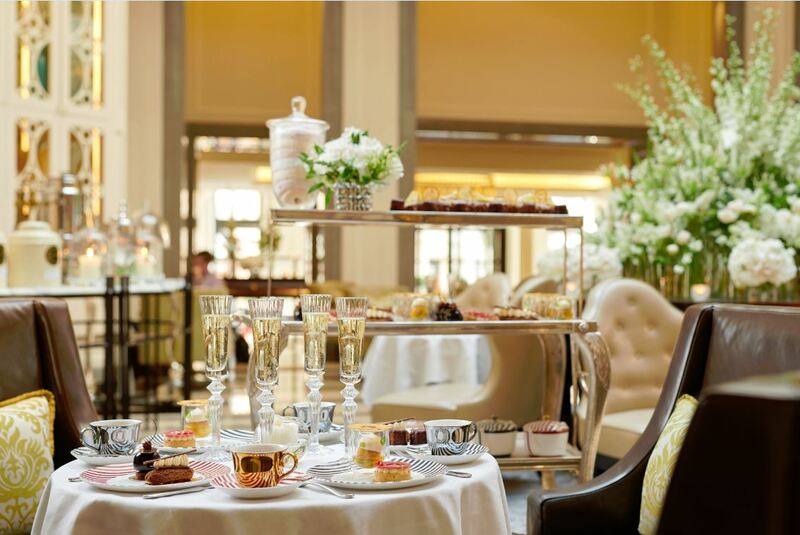 Undoubtedly one of the best afternoon teas in London, this is very popular with our visitors to Girls Afternoon Tea. Early booking is essential. Book a Christmas Afternoon Tea at Mr. Fogg’s Gin Parlour. Exclusive 25% Discount. Christmas Afternoon Tea at Rubens at the Palace, London. A stone’s throw from Buckingham Palace, Rubens at the Palace must surely boast one of London’s most unique views across the Royal Mews at Buckingham Palace. One of our most popular afternoon tea venues, the Rubens festive menu includes a cranberry candy cane, a mint chocolate Christmas tree, an eggnog profiterole, pear cheesecake, white chocolate and almond nougatine, orange mousse bauble chestnut and cherry tart and traditional mince pies. Tuck into a right Royal feast at Rubens at the Palace . . . 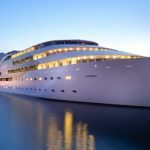 This must surely be the ultimate Christmas gift to yourself (even better if you can persuade Santa to buy it for you), an afternoon on board the luxury Sunborn London Yacht indulging in a delicious Champagne afternoon tea with pampering spa treatment. With outstanding views across Canary Wharf and the surrounding Docklands, this is one Christmas cracker. Take advantage of our exclusive 25% discount and unwind at the Sunborn Yacht Hotel . . . This Christmas the team at The Conrad London St James are inviting you to escape the cold winter temperatures and get cosy in the elegant and stylish surrounds of Emmeline’s lounge. Their talented chefs have been creating a Christmas cracker with seasonal flavours that would warm even the frostiest of hearts. Available from late November 2018. Go on, you know you want to. 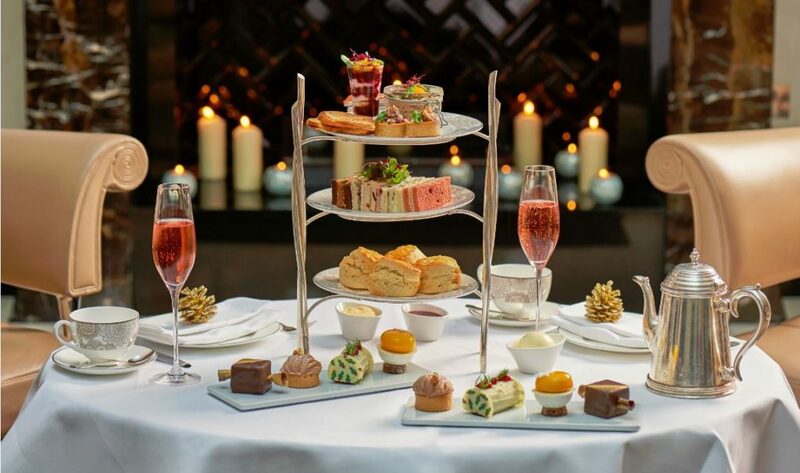 Treat yourself or someone special to Christmas Afternoon Tea at the Conrad London St. James. Exclusive 25% Discount. 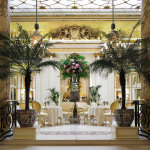 The epitome of decadence and luxury, afternoon tea in the Ritz Hotel’s Palm Court is the perfect spot to experience sheer luxury and take part in a quintessential British tradition. 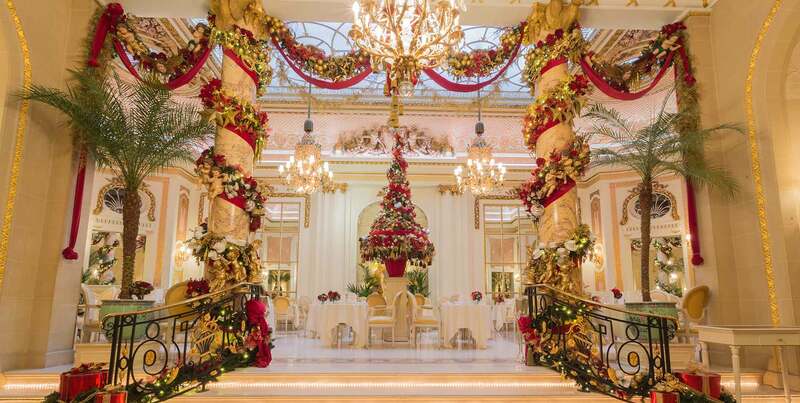 A delight at any time of year, the Palm Court at the Ritz will be transformed into a beautiful winter wonderland, bedecked with rich red and gold trimmings and a lavish Christmas tree in the centre of the room will complete the winter enchantment. The Ritz Afternoon tea menu will be given a seasonal twist. Relax in sumptuous surrounds and enjoy this festive treat served on an impeccable 3-tiered cake stand. 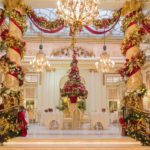 Indulge yourself with delicate finger sandwiches, delicious pastries, mouth-watering cakes and freshly made scones with Cornish clotted cream and strawberry preserve whilst listening to the glorious sounds of The Ritz choir singing carols. Why not treat yourself or someone special to a day to remember. Early booking is essential. Book Afternoon Tea at the Ritz . . .
Christmas cake, Christmas Stollen, gingerbread man, mince pies, chocolate brownie with cranberry icing and orange macaroon. Freshly cut sandwiches with seasonal fillings. Deeelicious. 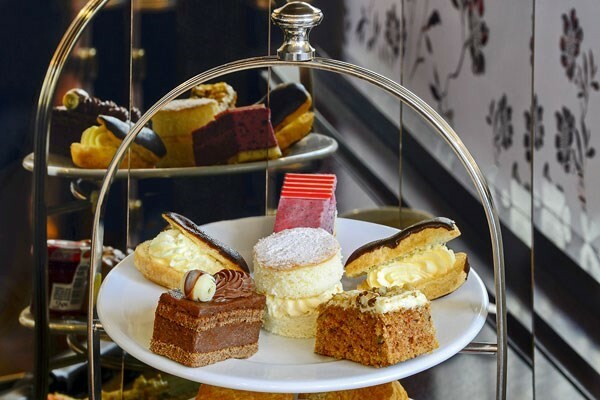 Offering a luxurious haven for a tranquil afternoon tea, the cosy ambience of the Egerton House Hotel in London’s Knightsbridge is the perfect venue to enjoy an afternoon of blissful relaxation and mouthwatering treats. And your always welcome to bring along your favourite four legged friends! Discover the Egerton House Hotel . 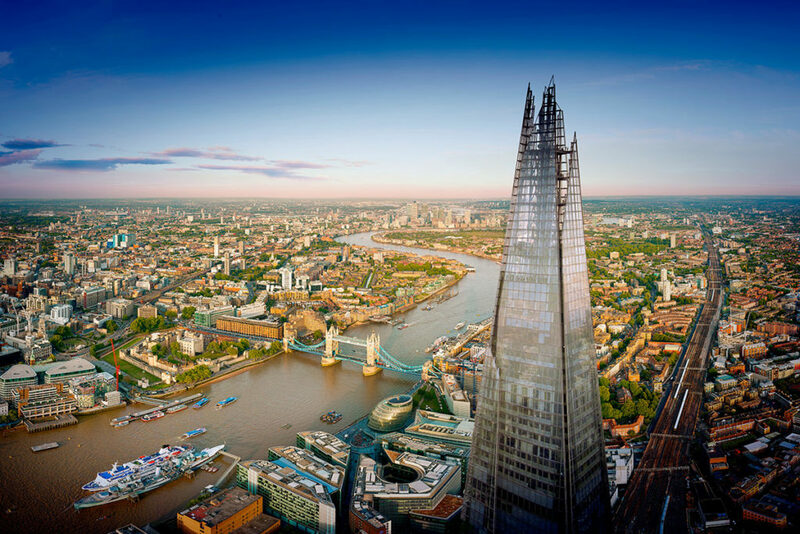 . .
A view from the Shard and Afternoon Tea will take you to new heights this Christmas. 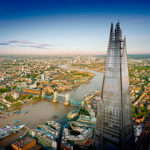 One of London’s best selling experiences the Shard is a popular London visitor destination throughout the year. Combine a view from the Shard with a delicious seasonal afternoon tea and enjoy a great day out in the capital. We have a variety of experiences available with our partners at Virgin Experience for you to explore this Christmas. Discover a Christmas gift experience at the Shard this year. Always a favourite, we love the lively and bustling atmosphere of Patisserie Valerie. Adding a festive twist to their French style afternoon tea this is a great venue to enjoy a break from Christmas shopping with friends and tuck into their mouthwatering savouries and cakes. With 27 venues sprinkled across London, find a Patisserie Valerie near you and check out our fantastic deal! Tease your tastebuds at Patisserie Valerie. Christmas Afternoon Tea on The Yacht, London. Step on board for a touch of 1920’s glamour, outstanding views and a delicious afternoon tea experience. 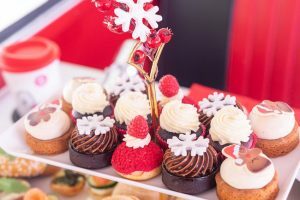 Christmas afternoon tea on board The Yacht London offers a unique riverside setting and somewhere different to soak up the sights of London at this festive time of year. As dusk begins to settle the London skyline illuminates the sky. Conveniently close to the city’s West End, this is a great location to explore the sights and sounds of this fabulous city. You are never to soon to start planning your Christmas afternoon tea on board the Yacht, London. Discover The Yacht London. (Not to be confused with the Sunborn Yacht). WANT MORE? 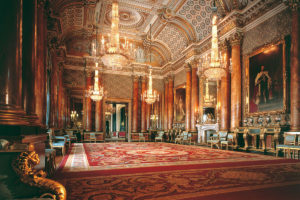 Why not visit our other afternoon tea venues in London. 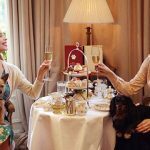 Girls Afternoon Tea: Discover the Best Christmas Afternoon Teas in London 2018 and book yourself a fantastic festive experience. 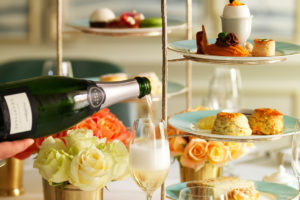 I am from overseas and would like to try having afternoon tea at Fortnum and Mason this December. May I know whether the 25% discount is applicable for overseas tourist? Yes. Absolutely. Just follow the link and you can book via Virgin Experience Days. If it’s for yourself select the e-voucher option.